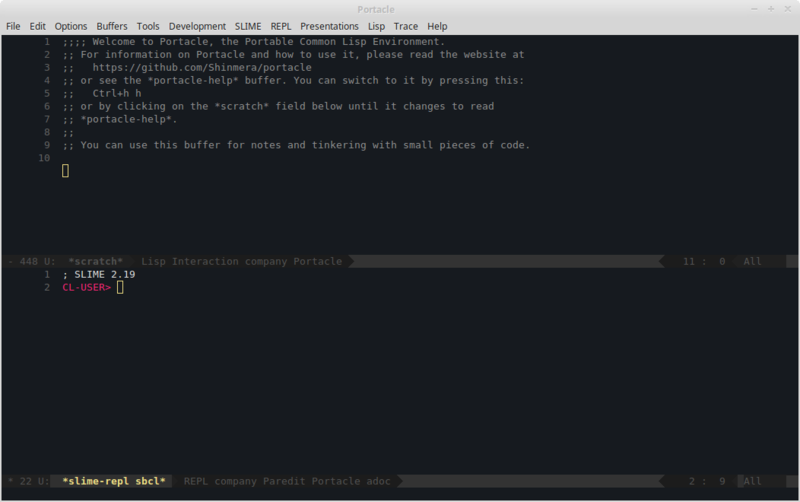 Portacle is a complete IDE for Common Lisp that you can take with you on a USB stick. It is multi-platform and can be run on Windows, OS X, and Linux. Since it does not require any complicated installation process, it is set up and running in no time. It lends itself very well both to absolute beginners of Lisp that just need a good starting point, as well as advanced users that want to minimise the time spent getting everything ready. Emacs is a very flexible and extensible editor that has been around for a long time. Due to its history and huge community, it is capable of covering pretty much any area of programming and more. Bundled with Emacs are some very useful packages, the major ones being Slime, Magit, and Company. SBCL is one of the fastest and most capable Lisp implementations available today. Quicklisp is the standard Lisp package manager that allows you to retrieve and manage over a thousand libraries with a few keystrokes. Git is perhaps the most widely used version control system today. It allows you to manage changes in code over small and large projects fast and efficiently. Portacle is rather straight-forward to setup and use. All you need to do is extract an archive. After that, you can freely move its installation folder around and even take it with you on a memory stick. If you are new to Emacs, Lisp, or both, you should also read the section after this one once you successfully completed the installation. Download the latest release and run it. It will ask you where to install it to, defaulting to your home folder. Note that you do not need to append portacle to the end of the path. After extraction, you can launch it by double-clicking the portacle.exe. Note that portacle.exe is tied to the portacle directory and needs everything within it to function properly. You can however create a shortcut to the exe to reach it more easily from your desktop. Download the latest release and extract it. Due to "security" reasons on OS X you must then move the Portacle.app within the extracted directory into another directory like projects/ and back again using Finder. From then on you can launch it by double-clicking the Portacle.app. The first time you launch it, OS X is going to block the application as it is "from an unidentified developer." You need to open System Preferences, go to Security, and click the Open Anyway button to mark the application as trusted. After that it should work straight away. Note that you cannot copy the Portacle.app outside of the portacle directory. You must take the whole directory with you. You can however drag the app into your dock. Download the latest release and extract it. You can then launch it by double-clicking portacle.desktop. The file may also be presented to you as just Portacle. Note that you cannot move or copy portacle.desktop elsewhere. It has to reside in the portacle directory for it to work. The window should be divided up into two regions, each of which display something called a buffer. One of the buffers, the one displaying CL-USER>, is the Lisp prompt. The other is the scratch buffer and should also contain some hints on how to reach a reference guide. You will notice that it automatically inserts closing parens and the end of the quote for you. To run it, move the cursor to the end by either clicking or using the arrow keys, and hit your ⏎ key. Congratulations! You just ran your first program in Portacle. You should probably also configure Portacle's default settings. To do this, press Alt+X (⌘+X on Mac), then type portacle-configure followed by ⏎. You should then see a prompt at the bottom of the window, in an area called the "minibuffer". Once you've answered all the questions, Portacle should be set and ready to go. Make sure to read the help document. It should explain all the basic terminology and commands on how to use the editor. To access it, press Ctrl+H H.
If you need help using Portacle, or would like to contribute to its development, please see the official repository. You can also chat directly with the developers over IRC, using the #shirakumo channel on Freenode. Portacle is brought to you by Shirakumo.